Forty Autumns is a tour de force. 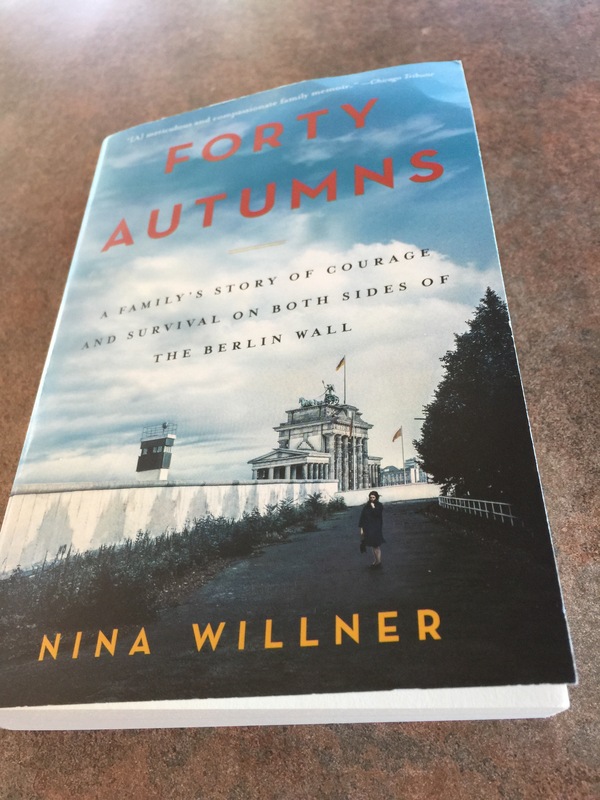 This stunning memoir is about the author, Nina Willner’s mother’s life growing up in East Germany during the Cold War and escaping while she still could. I have not read much about the Cold War, but this memoir packs a punch. It’s a tad hefty of a tome, but Nina’s mom, Hanna’s life is intriguing and sobering. Nina includes personal photographs which brings her mom’s life and her own from black and white into full color. From Kansas to the Emerald city it describes the heartache of what it’s like growing up under communism to knowing what freedom is like. What would it be like to be separated from your family by a wall, armed guards and police? To know you could be shot just by stepping a toe over the dividing line? To live in a world where every move you make is analyzed to make sure you don’t slip up, to be given the impression your immediate world is superior, when deep down you wonder if the other side is just as awful as you’ve been lead to believe. Unless you’ve been raised in a communist country this sounds surreal, but to think this was the norm in East Germany only 28 years ago is scary. This memoir is a powerful reminder to be thankful for our freedoms if you live in a free country. Not all country’s are free, but never give up hope if you don’t live in a free country. Thank you Nina for such a powerful testimony to your family’s strength for never giving up. This memoir was given to me for free in exchange for my review from TLC Book Tours, care of William Morrow, an imprint of HarperCollins. To purchase this captivating memoir please go check it out here. If you love to read and have a blog where you like to share your review of books you love feel free to check out TLC Book Tours. The way that the wall went up so quickly, separating families forever, has always fascinated – and horrified – me. Hanna’s story is sure to keep me turning pages!